We ended our Media + Architecture class early tonight (which unfortunately meant curtailing a really great discussion on architecture and film!) so that several of us — those of us who didn’t have 6:00 classes to attend — could trek uptown to the Bard Graduate Center to hear Lynn Spigel’s talk, “Media Walls: From Mid-Century Domesticity to Smart Home Environments.” We had read her Make Room for TV and discussed television and architecture last week. [We arrived 10 minutes late — damn New School elevators, stupid A train! — so we missed the introduction.] Shortly after Spigel started showing some historical images this evening, I thought, ein minuten bitte! This looks familiar! Once I got home, a quick consultation of my still un-transcribed notes from last May’s ICA conference confirmed that, yes, I’d heard her give an earlier version of this talk last year in Boston! I was glad to hear tonight how her work has progressed. For those students who couldn’t join us, I’ve promised to post my notes from the talk. My fellow note-taking attendees are welcome to amend these notes in the Comments section. Mark Weiser, the “father of ubiquitous computing,” believed that “the most profound technologies are those that disappear. They weave themselves into the fabric of everyday life until they are undistinguishable from it.” Spigel traces the disappearing technical object back to architecture — specifically to mid-century design. 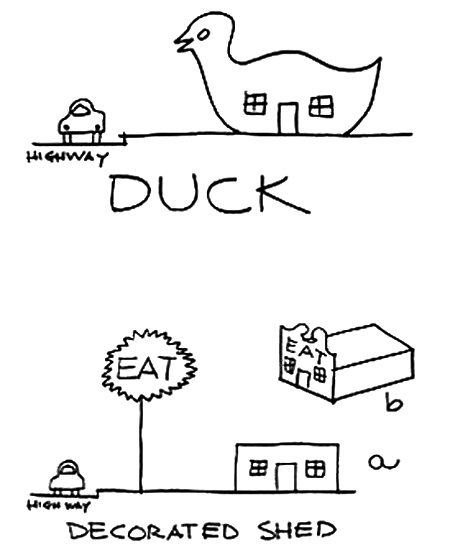 Architect/writer George Nelson, for instance, was a strong advocate for the disappearance of objects. 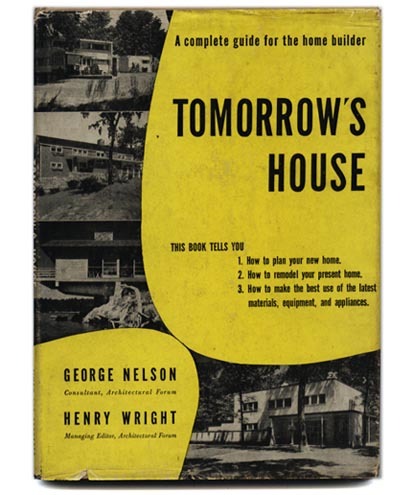 With Henry Wright, Nelson wrote Tomorrow’s House (1945), a book featuring sections on lighting and heating, living and dining rooms, sleeping and sound conditioning and storage (among others). Spigel noted that this book is also where he “invented” the term “family room” — a room that, as it was depicted in the book, allowed for separate gendered activities to happen simultaneously [full text of the book here]. 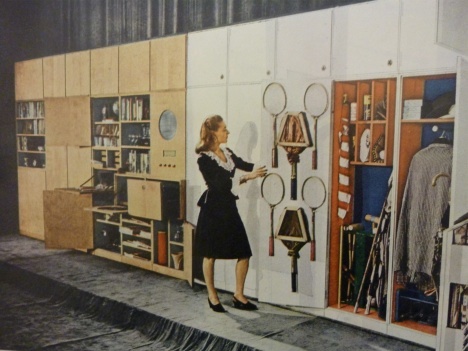 Tomorrow’s House also introduced the storagewall, a unit that would make objects disappear. Such a device was necessitated, Spigel proposes, by three converging trends: (1) the shrinking size of modern homes; (2) the decreasing number of domestic servants; and (3) the increase in the amount of “stuff” (my term) in the home — all of which contributed to clutter. The cluttered home was, at the time, a target for social reformers; Spigel cites the Hoover administration’s cleanliness campaigns and the 1922 Better Homes in America campaign. We should take note of how the problem of clutter was gendered (see the image below). According to Spigel, Nelson was particularly interested in addressing the mess that media — radio and television sets (the “horrible eye”), for example — created. He wasn’t a fan of the ornate cabinetry — much of which was in the ghastly Chippendale style — that had been developed to house these new media as they entered the home (Spigel talks about this in Make Room for TV). 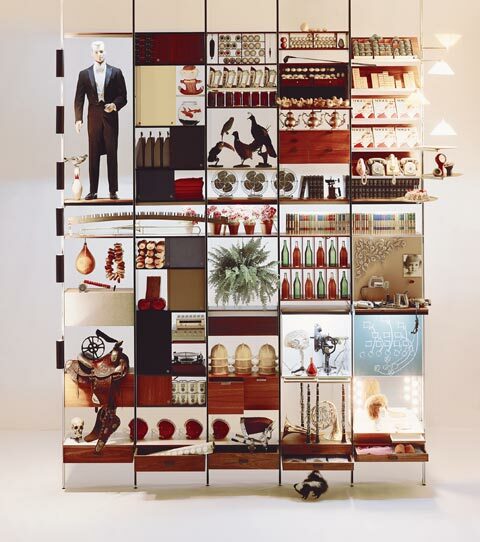 The storagewall was modular, and, because it was intended to work as a room divider, it was accessible on both sides. Nelson explained that it made more efficient use of the otherwise-wasted space between the home’s interior walls. 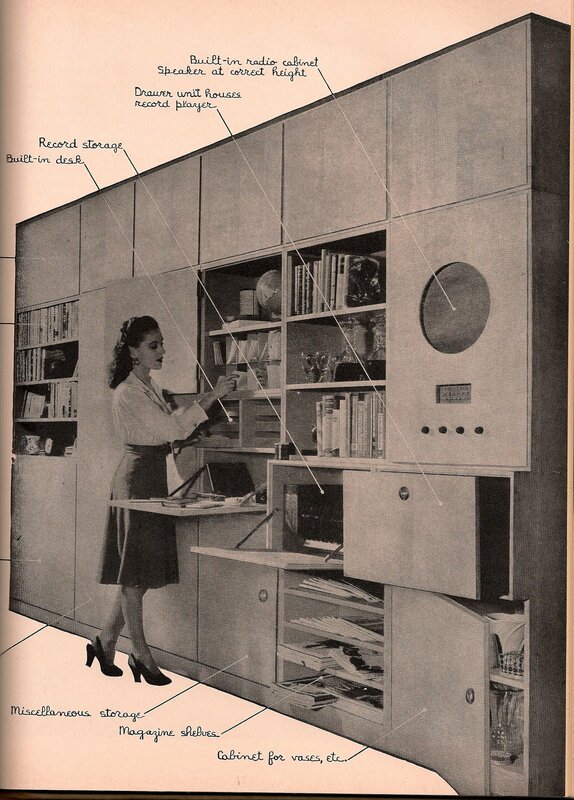 Tomorrow’s House presented the storagewall as “the key to the imagination of the home as a media space“; it contained modules for the radio, record player, speakers, television, phone, print media, and writing implements, and featured a fold-out desk. In the image above (two above, actually), in the blonde wood section to the left, above the open drawer, we see a module with a round portal; this section housed the radio, and that circle’s the speaker. 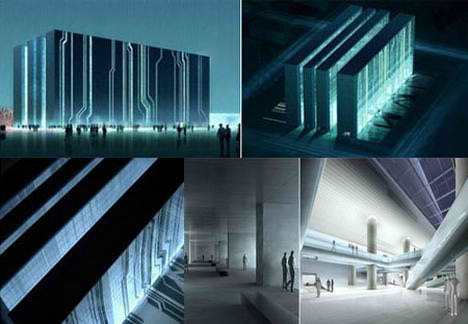 The storagewall imposed an order on these technologies and structured functional relationships among them. It fashioned domestic media — both “old” and “new,” both media of reception (e.g., TV and radio) and production (e.g, pens and paper for writing letters) — into a “media network” that Spigel likens to a “makeshift computer” (more on this later). The storagewall also often contained space for board games, which, when grouped with all the home’s entertainment media, fashioned the unit into the home’s leisure center, too. Yet, according to Spigel, popular press coverage of the storagewall — which appeared regularly in publications like Life and Better Homes & Gardens — rarely showed the unit housing sports gear (the above image may be a rare exception?). Press and publicity also commonly presented the storagewall as a “communication medium for the housewife” — a means to express herself through strategically placed vases or houseplants. Nelson’s 1957 Problems of Design contains a chapter titled “Design as Communication,” in which he explains that “[e]very design is in some sense a social communication, and what matters is…the emotional intensity with which the essentials have been explored and expressed” [p. 6]). The storagewall was thus a site for “reassembling the social life of the home.” It was a material site where women in particular renegotiated the relationship between homeowners and their (“disappearing”) servants and coordinated relationships among family members — between genders and generations — themselves. 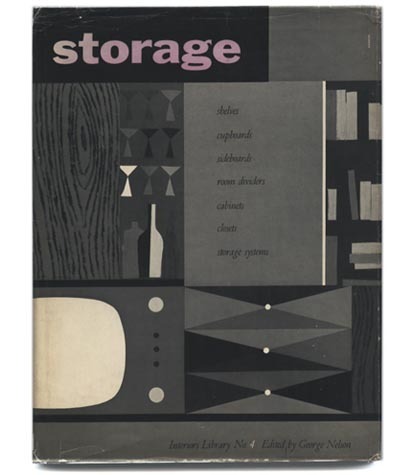 Spigel emphasized that the storagewall was not meant to be an all-purpose storage unit; there were certain objects it simply wasn’t meant to contain. Sentimental objects, for instance, which typically comprise a huge proportion of domestic clutter, had no place in the storagwall. 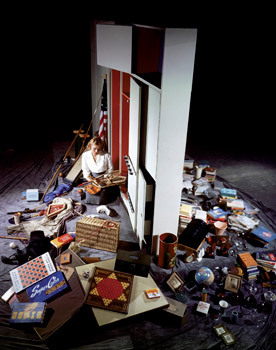 Spigel suggests that this is because Nelson conceived of domestic space as a space for “storage and organizing data” rather than a space for memories. She contrasts Nelson with Bachelard, who, referring to literary spaces of the 19th century — an era preceding the rise of domestic media — describes the home as a memory space, a “maternal paradise.” Bachelard’s home is an enclosed space that “doesn’t communicate with the outside world”; the only means of escape is through daydreams. Nelson focused instead on active storage — the storage of stuff that would be used, not momentos or nostalgia pieces. If I understand her correctly, Spigel attributes Nelson’s focus on utility and efficiency — and particularly his conception of the storagewall as a site for “organizing data” — in part to his experience in working with computers. He worked with the Eameses on the US pavilion at the Moscow world exhibition in 1959; he consulted with IBM engineers on the design of the SABRE scheduling/reservation system for the airlines; and he designed typewriters and computer terminals (John Harwood writes about much of Nelson’s IBM work in The Interface). This experience cultivated a very particular understanding of storage, and led to the conception of a storagewall that managed only particular kinds of clutter. Despite this desire to push away the clutter of nostalgia, and to model the home as an efficient data storage device, Spigel says, memory persists. The home “has never been modern,” to borrow a phrase from Latour. The storage wall never cleaned up all the mess. Two competing models of the home coexist, and live in dialectical tension — the concept of the home as a memory space, and the concept of the home as a storage space. The digital world creates its own clutter — both in the material form of obsolesced machines and useless adapters; and in the conceptual form of “information overload.” It’s interesting to note that Mark Weiser, Mr. UbiComp/UI/OS, lists “garbage collection” among his hobbies and has written frequently on the topic. Let’s attend to this garbage, examine the clutter. Rendering objects invisible, Spigel says (echoing many other theorists), “hides the social/political apparatus that creates them.” Paul Dourish and Genevieve Bell, in their recent Divining a Digital Future, advocate for studying the mess of digital infrastructures. 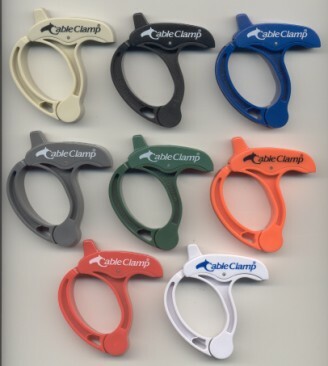 They sell these at my dad’s hardware store. I have at least a hundred in use in my apartment. 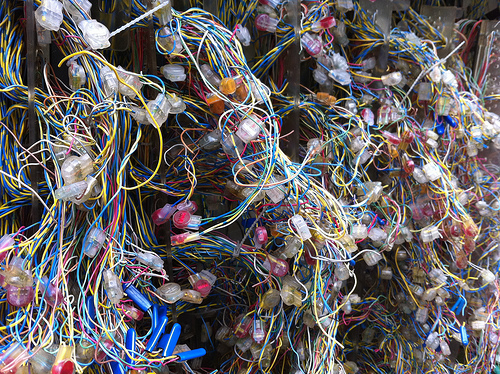 In her May 2011 talk at the ICA, Spigel recommended focusing on “the mess of infrastructures that arise out of Nelson’s creation” — which I’m guessing would include the wires stuffed behind the TV, gathering dust; the power outlets sourcing multiple storagewall modules. Did they have powerstrips and CableClamps in Nelson’s day, too? How would we design contemporary domestic interiors (or other interiors?) that, rather than “disappearing” the technological object, highlight its infrastructures — that somehow call attention to the “social/political apparatuses” that make this technology possible? Do we aestheticize our wires? (Pipes have already become “decorative” in renovated “raw” spaces.) Visualize our wifi? Amplify the hum of our 60 Hz electrical current? We talked in my “Libraries” class spring about designing libraries and archives that make people aware of the infrastructures (and their attendant politics) that deliver their “free” information. How do you do this without turning the building into a big, dumb digital “duck”?